A suit of armor imbued with Terra's thoughts and wishes. "Aqua, Ven... One day I will set this right." The Lingering Will is a collection of thoughts and desires of the Keyblade wielder Terra. It took control over Terra's discarded Keyblade Armor after his body was possessed by Master Xehanort. The Lingering Will is playable for a short time at the end of Terra's scenario in Kingdom Hearts Birth by Sleep; it made its debut appearance in the Kingdom Hearts series as a secret boss in Kingdom Hearts II Final Mix. "Your body submits, your heart succumbs...so why does your mind resist!?" The Lingering Will rises to fight Terra-Xehanort. When Master Xehanort extracts his heart in an attempt to possess Terra, Terra summons his Keyblade Armor in a desperate attempt to defend himself. The Keyblade wielder is just a moment too late, however; his body emanates darkness, symbolizing Xehanort has won. The newly born Terra-Xehanort discards the Keyblade Armor, as doesn't desire its protection from the darkness. With the No Name in hand, Terra-Xehanort walks off in triumph, only to become trapped in Will's Cage. Terra-Xehanort turns in shock to see Terra's Keyblade Armor reassembled and standing before him—Terra's rage towards Xehanort and his desire to protect his friends has given life to his discarded armor. Determined to stop Master Xehanort at all costs and get back its body, Terra's "Lingering Will" challenges Terra-Xehanort to a battle. Angered by Terra's continued resistance, Terra-Xehanort readily engages it. In the end, the Lingering Will is victorious in battle, but although Terra-Xehanort is knocked unconscious, it fails to expel Xehanort from Terra's body. The armored figure plunges its Ends of the Earth into the ground and slumps down, as Terra-Xehanort is consumed by the lightstorm created by the destruction of the χ-blade via Aqua and Ventus. The clouds that have masked the Keyblade Graveyard in darkness cover Kingdom Hearts in the sky above, and the Lingering Will is left alone. It silently promises Aqua and Ventus that someday, it will set things right. "Where is he? Xe...ha...nort... Is that you? Xeha...nort... Xehanort!" —The Lingering Will upon assuming Sora is Xehanort. Sora prepares to fight the Lingering Will. Eleven years later, a portal to the Badlands appears in Disney Castle. Sora, Donald, and Goofy enter it and find themselves standing before the kneeling Lingering Will. The animated Keyblade Armor mentions Aqua and Ventus before sensing Sora's Keyblade, and it mistakes Sora for the one it had chosen, Riku. Realizing its mistake, the Lingering Will asks why Sora is not him; it then wonders if Sora is Xehanort, slowly pronouncing the latter's name. Determined to fulfill the promise it made long ago to avenge itself and its friends, the Lingering Will rises to its feet and picks up its Keyblade. Sora and friends draw their weapons in preparation for the upcoming fight, and after an intense struggle, they eventually defeat their silent attacker. Upon its loss, the Lingering Will senses Ventus's presence within Sora and kneels back down. If Sora returns to battle the Lingering Will after this, it accepts his challenge, but it states that it has nothing left to give the young Keyblade wielder other than its contempt for Xehanort. Naminé finds her way to Lingering Will by following Sora's heart. Lingering Will wonders who she is and she explains that she is a witch who can manipulate memory. She also says she knows that he is bound by two sets of memories: Terra's and Xehanort's. She claims he will cross paths with Aqua and he must guide her so that she will not be confused by the darkness. Naminé tells him to keep fighting and never give up. Lingering Will calls Aqua's and Ventus's names. "Got you, Xehanort... How I've waited for this moment." —The Lingering Will responds to Terra-Xehanort's frustration to know its identity. Lingering Will clashes with Terra-Xehanort one last time. When Sora is in The Final World, he encounters Naminé's heart, who tells him that she found a connection Terra's "strong will" through his memories. Naminé explains if she makes contact with Terra's will, it can tip the scale in the guardians of light's favor. Soon after the guardians of light return to the Keyblade Graveyard, they are confronted by Terra-Xehanort again. Just when it looked like time would repeat itself, starting with Terra-Xehanort's strike to Ventus, the Lingering Will arrives and blocks the attack. Ventus and Aqua recognize it as Terra's Keyblade Armor), while Terra-Xehanort seems to not remember their last clash. The Lingering Will tells Terra-Xehanort about its wait for their rematch and begins fighting him. The fight soon gets further away from the guardians, while Lingering Will held the upper-hand during his fight with Terra-Xehanort, the result were not seen. After Sora freed Terra's heart from Xehanort's Guardian and transferred it back to his body, the Lingering Will ceased to exist. In the opening credits of Kingdom Hearts Re:coded, the Lingering Will is seen kneeling down after the defeat of Terra-Xehanort. 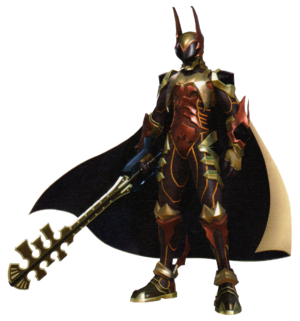 The Lingering Will is an animated suit of Keyblade Armor. Its helmet is mostly gold, except for its black visor, and it sports two red prongs (one on either side of the helmet) that point upwards. The arms, legs, and ribs of the Keyblade Armor are black and have orange patterns decorating them. Its knee guards, gauntlets, breast plate, and armored boots are gold, and there are other, smaller pieces of gold armor on its legs. The Lingering Will wears black pauldrons with gold edges. The front of the armor on its torso is red, as are small pieces of armor on its lower legs and gauntlets. The Lingering Will also wears gold anklets with red spikes on the back that curve upward sharply. In Kingdom Hearts II Final Mix, the Will's armor is much darker in coloration, possibly due to rust. It also wears a cape that is gold on the outside and dark blue on the inside. This cape was removed from the Lingering Will's design in Kingdom Hearts Birth by Sleep in order to avoid framerate issues. However, it was reintegrated in the cutscene after the Lingering Will defeated Terra-Xehanort at the end of Terra's scenario in Kingdom Hearts HD 2.5 ReMIX. As the Lingering Will is not truly a living being, it cannot feel or possess a personality of its own. Since it was brought to life by Terra's discarded thoughts and emotions, however, it is able to "feel" a strong contempt towards Xehanort, as well as a close connection and devotion to Aqua and Ventus. The Lingering Will also possesses a familiarity with Sora, who is carrying Ventus's heart inside him, and Riku, Terra's successor. When it appears in Kingdom Hearts III, the Lingering Will expresses no emotion when it speaks. It also does not speak more than a few syllables at a time, consecutively. The many different forms of the Lingering Will's Keyblade. The Lingering Will, like Kingdom Hearts II Final Mix's other secret bosses, is difficult to defeat. Its most basic move is a three-hit Keyblade combo almost identical to Sora's. The difference, however, is that the Lingering Will transforms its Keyblade into a drill-like object for the forward thrust that serves as the combo finisher. This is just one of many forms the Lingering Will's Keyblade assumes during the battle against it; another form it can assume is a whip that deals less damage than its blade form in exchange for greater speed and range. The Lingering Will can also fly at high speeds and use Terra's Ultima Cannon Shotlock. Unlike when Terra's Shotlock is used, however, the resulting blast can be deflected via a well-timed Guard to damage the Lingering Will instead. This leaves it vulnerable to further attacks. The Lingering Will can also transform its Keyblade into a Keyblade Glider or cog-like object to perform extremely quick attacks. The Lingering Will can also create a large rune on the ground below it as lightning rains down from above. At this point, the Lingering Will enters a berserk state that causes its arm gauntlets and helmet to emit a bright red aura. The Lingering Will gains the ability to split its Keyblade into two, making its combos extremely lethal. After the first two stages of the Lingering Will's rapid combo have been evaded, the last few attacks can be blocked by Sora via a well-timed Guard. The Lingering Will is also quite skilled at wielding magic. It can create an unusual-looking seal that either creates an orange or blue orb. An orange orb prevents Sora from attacking, while a blue orb blocks the use of magic and items. The Lingering Will may sometimes use Blizzaga while executing a Sonic Blade-like attack at low HP or when riding its Keyblade Glider. It will also use Magnega while atop its Keyblade Glider if Sora is too far from it. The Lingering Will can conjure drone-like objects which fire lasers at Sora, Donald, and Goofy, as well. It may sometimes transform its Keyblade into a bow and fire arrows that trap Sora in a triangular-shaped seal that drains his health at a fast rate; only a "Release" command can save Sora from it. If the player chooses the wrong command while Sora is trapped, Sora will expire regardless of Once More or Second Chance, although Peter Pan's Auto-Life ability will allow him to continue fighting. When playing as the Lingering Will during the final battle with Terra-Xehanort at the Keyblade Graveyard in Kingdom Hearts Birth by Sleep, it loses Terra's ability to use D-Links; the D-Link Gauge is empty and unable to be refilled for the entire battle. The Lingering Will does, however, retain Terra's immense power and has access to any abilities that were equipped to him before the battle begins. The Lingering Will also can use Terra's equipped Shotlock and all commands that were placed in his Command Deck. 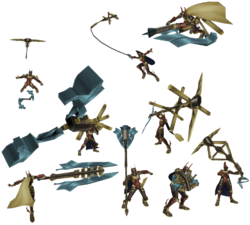 While Terra's Keyblade was able to be equipped with any Keychain of the player's choosing, the Lingering Will's Keyblade defaults to the Ends of the Earth. As Terra's possessed Keyblade Armor, the Lingering Will wields his former Keyblade, the Ends of the Earth. When Terra-Xehanort is created, he forsakes the Ends of the Earth in favor of No Name. Because Terra's will finds residence within his Keyblade Armor, the Lingering Will picks up the Ends of the Earth upon its creation and uses it to conquer its possessed body. The Ends of the Earth remains with the Lingering Will during its solitude at the Keyblade Graveyard; the animated Keyblade Armor uses the weapon a second time to battle Sora eleven years after its struggle against Terra-Xehanort. Under the Lingering Will's influence, the Ends of the Earth is able to assume different forms. The Lingering Will shares Terra's ability to summon a Keyblade Glider, using what was once a form of transportation for the lost hero as an offensive technique. Other forms the Ends of the Earth may take through the Lingering Will's influence include a chain whip, the massive cannon-like form used in Terra's Ultima Cannon Shotlock, a drilling gauntlet, and a harken-like weapon. Save for the Keyblade Glider and Ultima Cannon, these forms are all unique to the Ends of the Earth when it is wielded by the Lingering Will. The Lingering Will also holds the weapon in a different fashion in Kingdom Hearts II Final Mix than in Kingdom Hearts Birth by Sleep; the latter's version is identical to that of Terra. The Ends of the Earth, once wielded by Terra. Jiminy's Journal erroneously refers to the Lingering Will as a man covered in armor, rather than a hollow suit of armor containing the mind of one. Due to lack of voice acting, the Lingering Will's voice in Kingdom Hearts II Final Mix is represented by metallic grinding, similar to Xemnas in Kingdom Hearts Final Mix. ↑ Kingdom Hearts III Ultimania: "When Terra was revived it caused the Will to vanish, and the armor disappeared. But Keyblade Wielder's armour is like a Keyblade in that even if it disappears, it can be summoned again so long as the wearer is in their usual condition." ↑ Nomura: "We wanted to make it so that as many people could play together as possible, but in the end we could only do six. By the way, in the Kingdom Hearts II Final Mix secret movie you can see Terra in his armor with a cape, but we took off the cape in this game. It was to make processing easier when you're playing with six people. Processing of moving fabric can be slow, so the speed it runs at is completely different if he has a cape or not." This page was last edited on 23 April 2019, at 02:51.